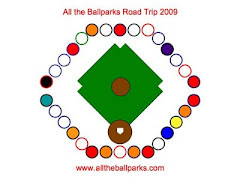 This blog began as a log of our summer 2009 road trip to all the Major League Baseball ballparks and a few other baseball themed stops. I now continue to update it with posts about ballparks and other baseball related things we experience. We got the Rays sticker at the team shop before the game and Dad put it on the car in the parking lot before we got in line to go inside Tropicana Field. Since it was the last one for the American League side I took photos of him putting it on. The Rays sticker has the diamond Rays logo with a baseball in the background. The American League side filled up quite well with the stickers for the league’s 14 teams.